manual calculation and the TRNSYS Simulation. the zone depending on the transmissivity of the window. So if you set the geosurf value of the floor to one, all the short wave radiation will hit the floor. the floor. To solve this, set the absorption coefficients of the floor to 1 and apply a good insulation. 3. There will be still a deviation of around 10 % caused by heat losses through the windows and walls. We have a little problem with type 56. I send you enclosed a sample project illustrating our problem. In type 56, we have one zone with 4 external glazed surfaces, with 4 orientations (namely ENE, 124 m2, SSE, 48m2, OSO, 124 m2 and Horizontal, 198 m2), and a boundary surface, with identical temperature. There are no internal loads. External radiation is fixed to 1000 kJ/hm2 on ENE, 2000 kJ/hm2 on SSE, 600 kJ/hm2 on OSO and 800 kJ/hm2 on horizontal, and assumed totally direct (ITotal = IBeam), with a zero incident angle for each orientation (this is no realistic, but we wanted to avoid problems with angle-dependant transmission coefficient). A cooling type is added to the building, in order to maintain ambient temperature to 26°C. All the windows have a SHGC of 0.387, for 0° incident radiation, calculated by LBNL Window, and a ratio of frame of 10 %. 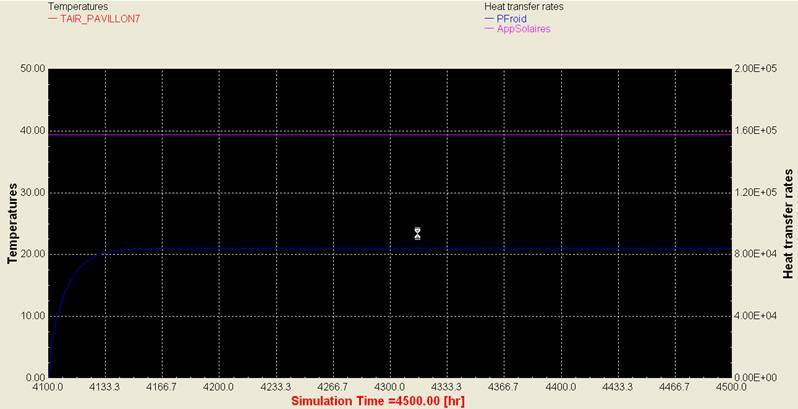 However, TRNSYS give us almost half of this load (P froid in this picture, VS AppSolaires calculated by TotalRad equation). Do you have any idea of the reason our hand calculation is so far from TRNSYS calculation?